Italy’s young netminder started the campaign with a lowly 76-rating, and was upgraded to 78 in February – advancing all the way to 90 for his TOTS (Team Of The Season) card. Expect a base rating for FIFA 18 of at least 81, as every major European club looks to tempt the 18-year-old away from Milan despite signing a new, four-year contract. The PAOK full-back – listed as a LB but also strong on the right – has gone the entire season with a rating of just 72, although he did receive a 74-rated in-form as part of TOTW (Team Of The Week) 13, and a monster 87-rated TOTS card. The Greek Superleague isn’t the best for building hybrid squads, but a gold base card next season should tempt more players into snapping up the strong, speedy Brazilian. No in-forms, no Man Of The Match (MOTM) items: those keen on the Arsenal defender have gone the entire season relying on his 67-rated standard silver card. An outstanding performance in the FA Cup Final, marking Diego Costa out of the game, should change that. Expect an upgrade to the gold bracket for FIFA 18, with a base rating of at least 75. Juve’s promising stopper will spend one more season on loan at hometown club Atalanta before joining the Old Lady next summer; you won’t have to wait that long to engage his talents. He started this season as a 69-rated silver card, with a winter upgrade to 74 – and an imperious TOTS card, rated 87, to end the campaign. GR+ predicts a rating of 77 for FIFA 18. The Monaco full-back is apparently set to sign for Manchester City this summer; even if that switch doesn’t materialise, a storming Ligue 1 campaign guarantees big attribute gains in FIFA 18. Rated 75 in FIFA 17, Mendy’s TOTS card saw him catapulted to an overall rating of 86 – GR+ is tipping him for a base rating of at least 80 for the upcoming season. Borussia Dortmund’s outrageously skilled wingman had quite the campaign in both real life and Ultimate Team, scoring seven different cards in a single season – ranging from a mediocre 77 base card to a dominant, 91-rated TOTS variant (with 99 pace). His January upgrade to 80 saw a bump of three points, and you can expect similar as FIFA 18 approaches: 83 to begin with, followed by another leap if he starts well. Linked with Newcastle earlier in the year, Nice’s attacking midfielder missed the final two months of the season with an ACL Injury. That didn’t stop him making the Ligue 1 TOTS, however, after a 29-appearance, 8-goal debut season on the Cote D’Azur. He started the season as a 71-rated silver card, was upgraded to a gold 78 in January, and should crack the 80 barrier come FIFA 18. It’s been a busy 12 months for the former Arsenal winger. Bought by Werder Bremen last August, a fine season saw Bayern Munich purchase him this June – then immediately farm him out on loan to Hoffenheim. His rise in FUT has been equally heady, from 73-rated silver card to 77-rated gold and, in TOTW 24, an 81-strong in-form. Look for him to clock in at 79 for FIFA 18. Fantasy Premier League players know all about the majesty of King: he sealed numerous pretend titles thanks to a breakout 18-goal campaign. It’s therefore incredible to consider that he went the entire FUT season as a 72-rated silver card, with just one TOTW appearance to show for such excellence. Expect that to be rectified with a 76-rated gold base card to kick off FIFA 18. Astonishingly, the base card for Ligue 1’s Young Player Of The Year remains a silver, with just 81 pace and 64 shooting – although there are five upgrades available, such as an 89-rated TOTS gem. No player in football is likely to take a greater leap for FIFA 18. I’m talking a rare gold card, with an overall of at least 81, and massive improvements in speed and finishing. Despite being one of English football’s hottest properties, the United striker’s January upgrade was limited to a single rating point: from 76, to 77. That’s likely because, with a pace rating of 90, he already feels overpowered. Even so a jump to at least 80 for FIFA 18 beckons, bringing him in line with the limited-edition Squad Building Challenge card available briefly before Christmas – that one had a pace rating of 92, and OVR of 82. 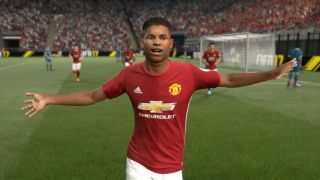 FIFA 18 is out on 29 September – and you can get up to speed on all its new features through GamesRadar’s rundown of everything you need to know.